A phenomenon of the 1940s, the superhero formerly known as Captain Marvel embodies a simpler era of comics, the sock‘’em Golden Age of godlike costumed do-gooders. But then, what superhero-addled kid of any generation hasn’t at some point wished for a secret identity, powers, and an opportunity to fight evil in any form? By saying the magic word “Shazam,” the orphan newsboy (and later, cub radio reporter) Billy Batson could become a muscly, full-sized superhero: red suit, little Napoleonic cape, big zigzagging lighting bolt across the chest. This alter ego was, acronymically, smart as Solomon, strong as Hercules, tireless as Atlas, thunderous as Zeus, brave as Achilles, fast as Mercury. He could fly and shoot electricity from his fingertips, foiling his nemesis, Dr. Sivana, a bald-headed megalomaniac whose debut preceded the first appearance of Lex Luthor by a few months. At the height of his popularity, Fawcett Comics’ marquee creation outsold Superman, leading DC to take legal action over purported similarities between the World’s Mightiest Mortal and the Man Of Steel. That decade-long legal battle has become as much a part of the character’s backstory as the wizard Shazam, who first entrusted Billy with his name and powers after whisking him away on a magical subway train. The first comics superhero to get his own movie (the 1941 Republic serial Adventures Of Captain Marvel, co-directed by William Witney, the king of pugilistic low-budget Westerns) was effectively sued out of publication, missing the entire mid-century Silver Age of comics, including the introduction of Marvel’s own Captain Marvel. By the time DC acquired and resurrected the character in the early 1970s, “the original Captain Marvel” was an anachronism. The genre had begun to mature, but he (with some irony) had remained a boy. But if Shazam (as the hero is now officially known) is destined to always be seen as a symbol of the bygone days of chisel-jawed heroes and mad scientists, his kid appeal is timeless. 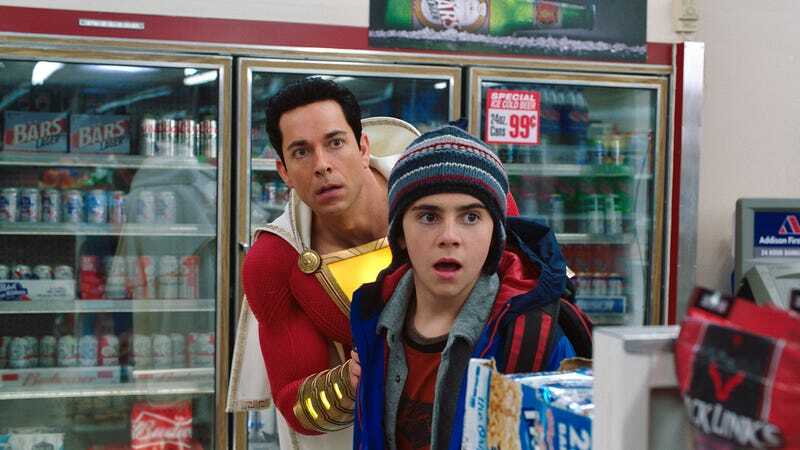 Shazam!, which marks the character’s return to the big screen some 78 years after the Witney serial, positions itself as a blast for a different past—directed not only at actual kids of a certain age, but also at the inner 10-year-olds of grown-up viewers raised on ’80s hits like Big (which gets an homage in a toy-store sequence) and Gremlins (from which it borrows a Christmastime setting). As such, it continues the vein of the most recent DC Comics adaptation, Aquaman, breaking with the Strum-und-Grit approach that characterized Zack Snyder’s shepherding of the franchise; if DC movies can’t offer the sweeping arcs and conflicts of the Marvel Cinematic Universe, they can at least be forgettably fun. In keeping with the current comics origin of the character, Billy (Asher Angel) is now a delinquent teenage foster kid from Philadelphia, and not exactly the pure-hearted boy of his Fawcett years. His latest run-in with the law lands young Billy in the home of the Vasquezes (Cooper Andrews and Marta Milans), working-class saints who already have five other foster kids living under their roof. Among them is Freddie Freeman (Jack Dylan Grazer), a nerd, collector of superhero memorabilia, and born sidekick who immediately latches on to his new foster sibling. On his first day at his new school, Billy ends up slugging one of Freddie’s wedgie-inflicting, truck-driving bullies (the teen stereotypes offered up here are, at this point, well into middle age), escapes into a SEPTA train, and is transported to the extradimensional cavern of an ancient wizard (Djimon Hounsou) who has searched for decades for someone to confer his powers. Admittedly, Billy is not the original Shazam’s ideal candidate. But the evil Dr. Sivana (Mark Strong) has recently unleashed the Seven Deadly Sins—monstrous gargoyles that hearken back to the special effects of films like Ghosterbusters II—and is poised to take over the world. Like Billy, Sivana was once taken away to Shazam’s lair as a child, but failed the wizard’s test, as have hundreds since. With no time to keep looking for a more fitting replacement, the bearded sorcerer imbues Billy with his magic before crumbling to dust. 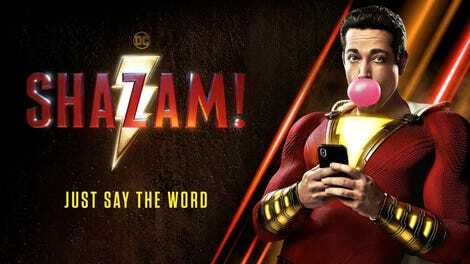 Now, all he has to do is say his name, “Shazam,” and he’ll be transformed into an adult superhero (Zachary Levi) in an old-fashioned puff of lighting and smoke. The movie knows that this is all eye-rollingly silly; at first, Billy can’t even say the word with a straight face. It might even be read as a commentary on DC’s attempt at rushing into an Avengers-style crossover film with the lamentable Justice League. But while the story of an extremely overpowered champion rising to challenge a one-dimensionally sinister baddie might seem like the epitome of simplicity, Shazam! is still a modern-day tentpole blockbuster, overburdened with backstories for both hero and villain and subtexts that it can’t (or won’t) fully articulate—occasional gunk in the gears of what might otherwise be a fast-moving machine.